Spodgrit is a crushed coarse grey sand primarily used for sub soil drainage and occasionally in some grades of concrete. Spodgrit is a naturally occuring mineral which contains traces of arsenic. It has recently been identified that the product has been used as a water filter. Tests indicate that such use can leach arsenic above the maximum recommended level of drinking water for humans. The product was supplied only in Western Australia by KD Powers & Co, Podmore Holdings Pty Ltd, Hesketh Contracting, Hanson Construction Materials Pty Ltd and Talison Greenbushes Pty Ltd. When used as a water filter Spodgrit can leach arsenic above the maximum level of drinking water for humans. Arsenic is a poison and a carcinogen. 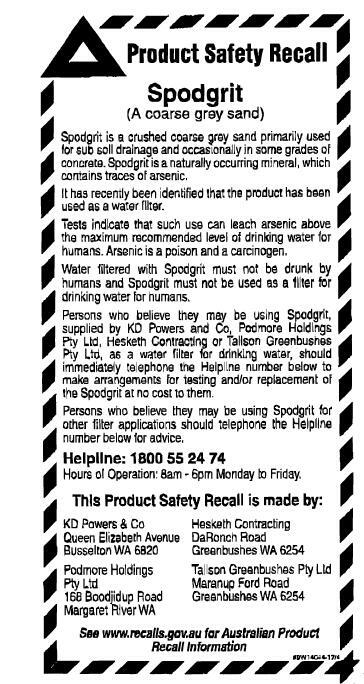 Persons who believe they may be using Spodgrit supplied by KD Powers & Co, Podmore Holdings Pty Ltd, Hesketh Contracting and Talison Greenbushes Pty Ltd as a water filter for drinking water should stop drinking the water and immediately telephone the Helpline Number: 1800 55 24 74 between 8am and 6pm Monday to Friday, to make arrangements for testing and/or replacement of the Spodgrit at no cost to them. Persons who believe they may be using Spodgrit for other filter applications should also telephone the Helpline number for advice.